Seachem Flourish a complete supplement for the planted aquarium. It provides micro elements, trace elements and other essential nutrients. Our product does not contain any significant levels of nitrogen or phosphorus. In simple terms, Macro elements are elements in large supply and micro elements are usually only needed in trace amounts. 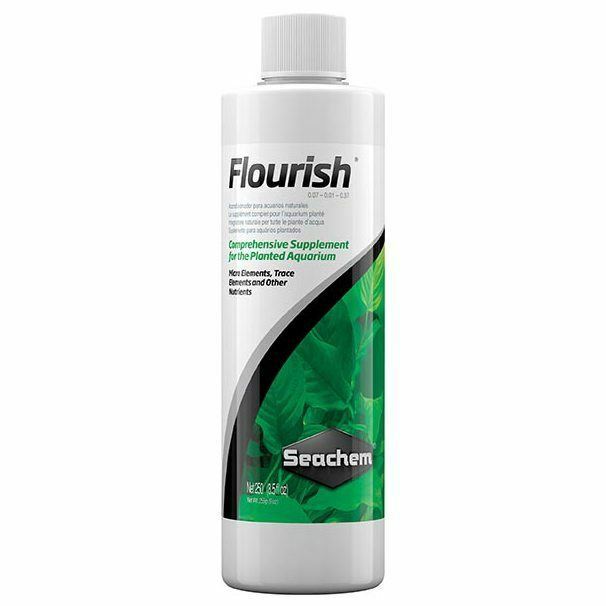 Seachem Flourish is a baseline plant supplement which is also safe for tanks that contain shrimps. It has a broad spectrum of crucial trace elements, vitamins, and amino acids. Seachem Flourish is also rich in gluconate iron, manganese, calcium, magnesium, potassium, inositol, choline B12, biotin, and other factors that we know to be very beneficial for aquatic plants. Customers can use it as a growth stimulator for aquarium plant stems and leaves. Our product does not contain any phosphate or nitrate or other fertilisers that would encourage algae growth and as a result is completely safe to use. For macro element (NPK – nitrogen, phosphorus, and potassium) fertilisation, use Flourish Nitrogen, Flourish Phosphorus or Flourish Potassium as needed. Flourish is safe for invertebrates such as shrimp. 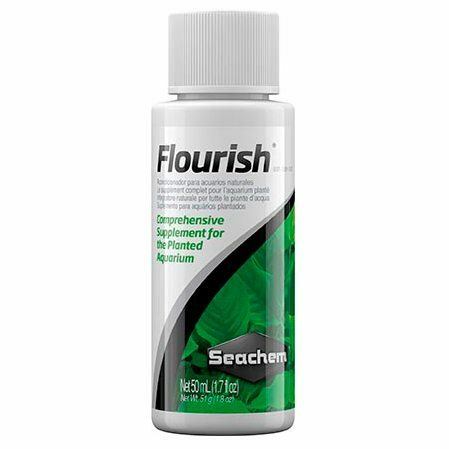 We designed Seachem Flourish to be used with other macro and micro-nutrient supplements. Other fish tank supplement manufacturers try to include all the required nutrients in one product, however, using these products can lead to overdoses of micro-nutrients in an attempt to raise macro-nutrient levels and lead to the destruction of the delicate eco-structure of your tank. Use Seachem Flourish as a baseline. Just add whatever Macro element your planted aquarium is short of and this will ensure your plants remain strong, healthy and vibrant. Use 1 capful (5ml) for each 250l once or twice a week. For smaller doses, please also note that each cap thread is approximately 1ml. Also, you should refrigerate Seachem Flourish and, if cared for correctly, your product will keep for 3 months after opening.